I can only hope that someday in your life you can just sit back, relax, and enjoy some uninterrupted Alfred Hitchcock movies. They are just so rich. 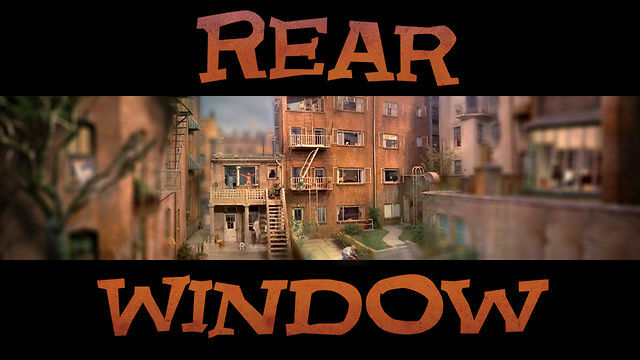 Take for example Rear Window, the setting in this film is everything and it’s only one large set. You may not think a film of a guy in a wheelchair looking out his rear window onto the courtyard of his apartment and its other inhabitants sounds like the fodder for action and suspense, but believe me, in the hands of the master – it’s riveting. The setting in this film, like most settings crucial to the narrative, is almost a character in itself. We get so much information in the opening panning shot. Before a word is spoken, we know things about our protagonist like he’s a photographer, he’s been in an accident, he has photographed famous people, and his neighbors all have distinct characters. 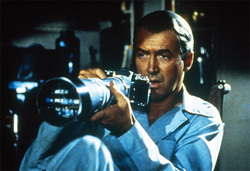 It shouldn’t be surprising then, that the main character played by James Stewart spends his time looking out his window at his neighbors. He’s a photographer…a professional observer. Hitchcock raises this pastime to an almost deviant voyeuristic level. He becomes convinced that his neighbor has killed his wife and manages to convince those around him of the same thing. The voyeurism takes a turn in a scene when the man (played by Raymond Burr) turns his gaze back into Stewart’s apartment. The viewer then becomes the viewed. His wheelchair-bound state makes him vulnerable as he cannot escape his setting. Even though there is only on set in the film, it only becomes claustrophobic when the killer arrives. 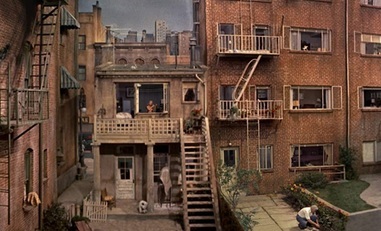 Until then, Hitchcock manages to keep us interested by including moments of the neighbor’s lives. Hitchcock always seems to manage his settings for the greatest effect. 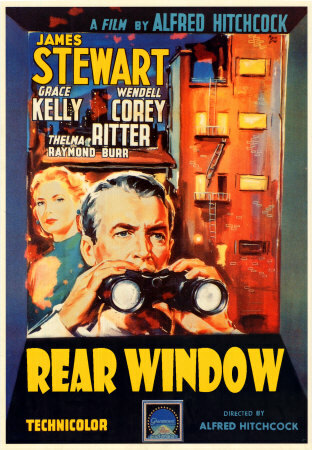 From Rope to Lifeboat to Rear Window and to some extent Dial M for Murder, there’s a very limited setting, yet its character is just as much a part of the film as the actors! Seriously, treat yourself to a Hitchcock film tonight! A look at how setting influences narrative.